New York, United States (Reuters): The United Nations Security Council will meet on today over North Korea’s nuclear test at the request of the United States, Japan, Britain, France and South Korea, the U.S. mission to the United Nations said in a statement on Sunday. North Korea conducted its sixth and most powerful nuclear test on Sunday - in violation of U.N. resolutions - which it said was an advanced hydrogen bomb for a long-range missile. 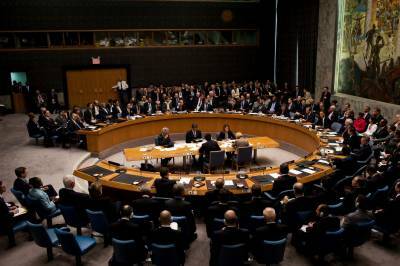 The U.S. mission said that the 15-member Security Council will meet at 10 a.m. (1400 GMT) on Monday. North Korea has been under U.N. sanctions since 2006 over its ballistic missile and nuclear programs. Typically, China and Russia only view a test of a long-range missile or a nuclear weapon as a trigger for further possible U.N. sanctions. The council last month unanimously imposed new sanctions on North Korea over its two long-range missile launches in July. The resolution aimed to slash by a third the Asian state’s $3 billion annual export revenue by banning exports of coal, iron, lead and seafood. Diplomats have said the council could now consider banning Pyongyang’s textile exports and the country’s national airline, stop supplies of oil to the government and military, prevent North Koreans from working abroad and add top officials to a blacklist to subject them to an asset freeze and travel ban. Japan urged Washington last week to propose new sanctions after Pyongyang fired a medium-range missile over North Japan on Tuesday. The United States traditionally drafts resolutions to impose sanctions on North Korea, first negotiating with China before formally involving the remaining 13 council members. Following the nuclear test on Sunday, Britain, Japan and South Korea pushed for new U.N. sanctions, while China and Russia said they would “appropriately deal” with North Korea. “We should also expect ‘more of the same’ from China (and Russia) in claiming that the U.S. is also to blame and calling on Washington to appease Pyongyang with front-loaded concessions and placate it with dialogue, despite the fact that North Korea is clearly only interested in dictating terms, not in negotiating,” he said. Any new sanctions would build on eight resolutions ratcheting up action against Pyongyang over five nuclear tests, four long-range ballistic missile tests and dozens of medium-range rocket launches. The past three substantial resolutions have taken between one and three months to negotiate. A resolution needs nine votes in favor and no vetoes by the United States, Britain, France, Russia or China to pass.